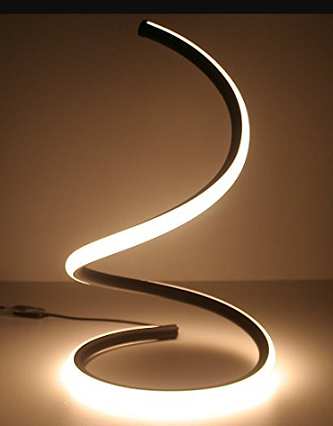 Its a curved LED Desk lamp creates an artistic look in your room. SkyeyArc Spiral LED has a contemporary minimalist lighting design which creates warm, white and stepless dimmable light with just 13Watts. This spiral LED lamp has around 14-inch height with an 8.3-inch diameter which adds superb decoration to your routine and all-purpose occasions. It will surely add awesome style to your furniture, shelf, stand or in a bedroom. This spiral lamp is very energy efficient and has a color temperature of 3200 Kelvin with brightness range from 100 to 550 Lumens. Just plug it into a UL listed power adapter, start it, and hold the switch to adjust the brightness display. The maximum brightness is also enough to read or study so it's productive too in that way. SyeyArc does not support remote-controlled on/off as it uses touch sensitive switch instead of a physical switch.